June 21st update – My contact at Innis & Gunn followed up with me today to let me know that they initially sent me the availability for another Innis & Gunn brew. Canada Day 2012 is available in all provinces other than Newfoundland, PEI and Quebec. 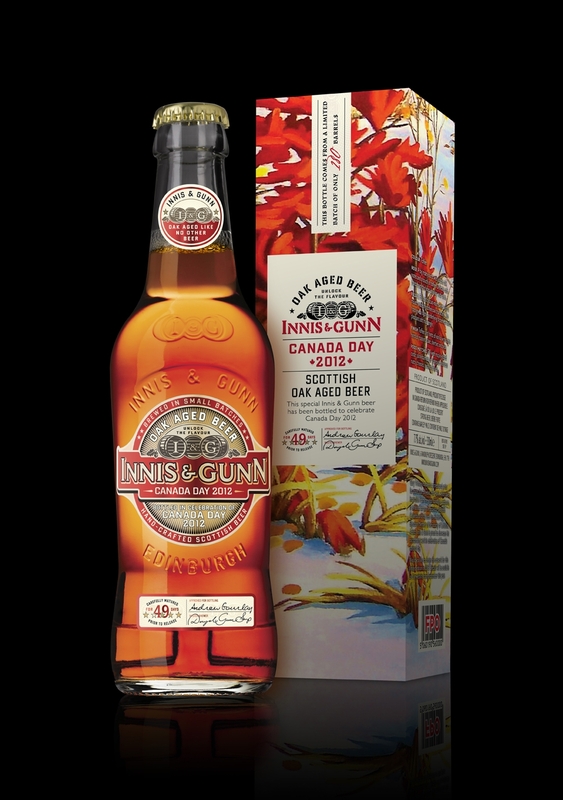 Editor’s Note: I recently had a representative from Innis & Gunn send me a press release regarding a limited edition Canada Day Beer. In a follow up email they confirmed that the new beer is expected to be available in all provinces other than PEI including some of the N.S. Private Liquor Stores. Toronto: Innis & Gunn, brewers of Canada’s favourite Scottish beer, today announced that each bottle of its Limited Edition‘Canada Day 2012’ beer will be packaged in cartons featuring original artwork by British Columbia-based artist, Gary Whitley.Released every May to celebrate Canada’s birthday and to recognize the country’s special contribution to the Innis & Gunn story, the Canada Day brews are available by the bottle at fine beer, wine and spirits retailers across the country in very limited quantities.This is the second release from Innis & Gunn to feature original Canadian artwork. Gary’s design was chosen from a group of over 60 members from the Society of Canadian Artists (SCA) by a judging panel that included 2011-featured artist, Deborah Colvin. In December 2011, members of the non-profit artists’ organization dedicated to expanding the visibility and stature of visual arts in Canada were asked to submit original artwork that best reflected the country’s rich tapestry. “We are very proud to again spotlight a member of the extremely talented Canadian art community,” said Innis & Gunn owner and brewer Dougal Sharp. “We feel Gary Whitley’s work perfectly reflects the pride and spirit of Canadians and we are excited to share this specially crafted, oak-aged brew with our largest export market,” concluded Sharp. Innis & Gunn Oak Aged Beer was accidentally discovered and developed by Dougal Sharp in 2003. Initially approached by a Scotch whisky distillery to make a beer-finished whisky, the brewery recognized the exceptional quality of the special beer they created and poured away after seasoning their oak barrels. Using this revolutionary technique of aging beers, the American white oak barrels infuse Innis & Gunn’s Original Oak Aged Beer with toffee and vanilla flavours and aromas during a special maturation process. This new category has managed to attract many new drinkers to beer both in the UK and across its six major export markets (Canada, USA, Ireland, Sweden, Norway and Finland). Early 2010, Innis & Gunn was named ‘Business of the Year’ at the annual Scotland Food & Drink Excellence Awards and also became the first Scottish beer company in 22 years to be handed the prestigious Queen’s Award for Enterprise: International Trade. Represented by Peter Mielzysnski Agencies Ltd., Innis & Gunn brews are available at fine wine, beer and spirit retailers across Canada. Propeller Brewing Company will host their first Prop’r Cask Night on Friday July 27, from 6pm – 8 pm. They’ll be pairing a surprise one-off brew alongside some fine local food courtesy of Harbour City Bar and Grill. Tickets are sold on a first come/first serve basis are are limited to a total of 40. To reserve tickets, email Tracy at Promotions@drinkpropeller.ca and stop by the brewery to purchase prepaid tickets. Tickets cost $15.00 in advance, or $20.00 at the door. Cask Night includes a sampling Propeller brands, a taste of the Cask and an appetizer selection from a great local restaurant. One of the Propeller brewers will unveil and lead the ceremonious tapping of the cask at approximately 6:30pm and will be around to answer all questions about unfiltered, unpasteurized cask-conditioned beer. Brewed in Fredericton, New Brunswick (a far cry away from Cologne, Germany), this crisp, LIGHT and refreshing ale is by most definitions a “Kölsch”. For the non-New Brunswickers reading this, 506 is N.B.’s area code. There is also a note on the page saying that it is available while supplies last at the Brewtique in growlers… for now. Here’s hoping that’s a sign it’ll be popping up in 500ml bottles in the near future.